Characteristics: Tempered glazing 10mm thick, discreet aluminum profiles, electrical motors. Basic dimensions: Aluminum columns 40mm wide and 80mm deep. Motor box 100mm high and 160mm deep. The retractable-telescopic glass window RW60 offers maximum ergonomic functionality and flawless design aesthetics, offering a smart solution to numerous architectural requirements. It consists of three glazed frames, two of which are slid and parked behind of a fixed one. It works with an electric motor which is placed inside an aluminum box at the top or at the bottom end of the system. When the fixed glass-board is placed at the lower end, the two moveable panes are dragged downwards forming a glass parapet. When the fixed glass-board is at the top end, electromagnetic locks are used to secure the panes. The system offers great flexibility, as it can be adjusted to the needs of each individual opening, with maximum values: 3m in width, 5m in height – total surface limit is 10m2. The glazing used is tempered, 10mm thick, while all aluminum parts can be anodized and painted with electrostatic paints available in a wide range of colors and textures. Numerous applications, in professional spaces (e.g. restaurants) as well as in residences. Ideal for the perimetrical enclosure of shops or gardens. When opening, if the fixed pane is installed at the lower end of the system, the moveable panes are dragged downwards, forming a glass parapet. 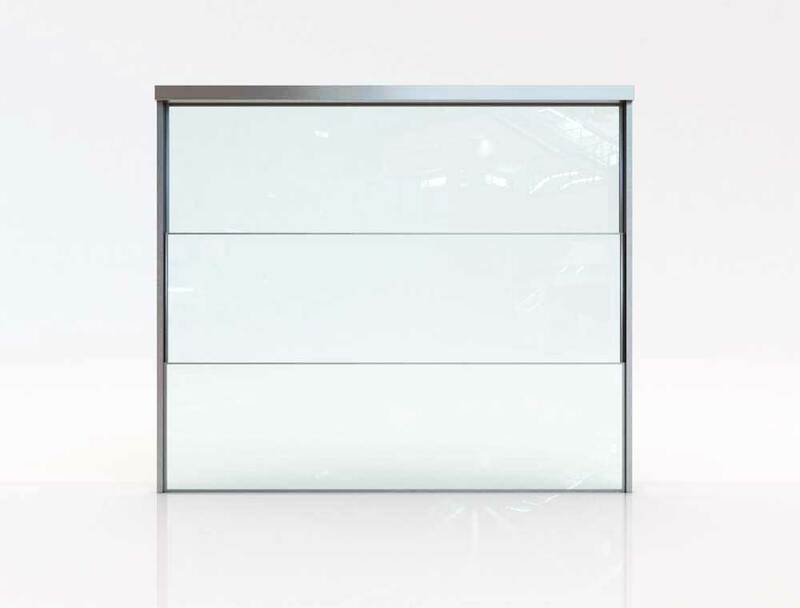 Respectively, when the fixed pane is installed at the top end, the system works as a window, offering an ideal solution when placed in front of a counter-top (e.g. in a cafeteria or in residences, between the kitchen and a living room). Space saving: When the window opens, the moveable panes are positioned behind a fixed frame, avoiding any requirement for additional storage space. Ease of use: Either wireless or wired operation, operating the system at the touch of a button. Minimalistic aesthetics: Simple, contemporary design which maximizes the glass surface. Thin, discreet aluminum column. Design flexibility: Just as with any other Salinox product, the RW60 is modified in size to fit into any opening (within the allowable size range). Choice between one or two moveable panes, as well as the direction of movement (upwards or downwards).